Welcome to Gilding the Greyhound! 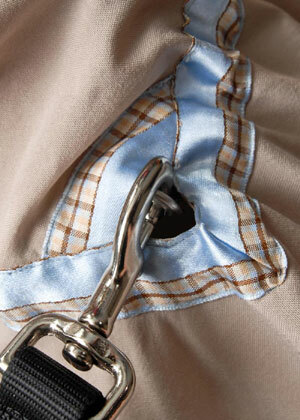 We make the classiest coats, raincoats and suncoats for your dog. 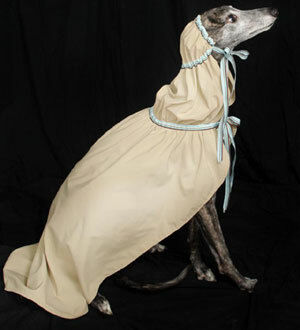 While we started designing primarily for sighthounds, we now make distinguished duds for all breeds. Our coats are functional and elegant, they are tailored to a sight hound's unique shape and they can be custom-made for your hounds. We can hold a trunk show at your rescue group's Meet'n'Greet, click here for more information. When on location, we contribute a percentage of our profits to the host greyhound rescue program. In addition, we regularly support Greyhound Friends of New Jersey, the source of three of Susan's adopted or foster hounds. Winter coats are made of mid-weight polar fleece. Wide belly covers are among available options. Coats can be ordered reversable to polar fleece, micro suede, or water resistant nylon. Winter coats and suncoats can be personalized / monogrammed. 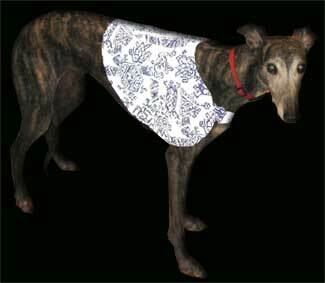 Suncoats protect your hound against harmful UVA/UVB rays. Click here to learn more about the importance of UVA/UVB protection for your hound. 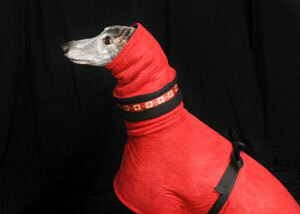 Snoods co-ordinate with the coats and come in several varieties. Everything is washable. However, snoods and collars with fur or beads should be hand washed for best results. In addition to the coats, snoods and hats pictured, we do a limited line of "Uptown Hound" coats, as well as custom orders. Call or email for details. Check out the colors and designs on the Products page. Email is best! Since we may be on the road with our trunk shows, we may not get your phone call right away. However, we try to respond to calls & emails within 24 hours. Closeup of fine detailing and leash opening.